WATCH: Selena WINS Carpool Karaoke By Singing Taylor Swift After Riding A Rollercoaster! FINALLY. FINALLY. FINALLY... It's the issue of Carpool Karaoke we've been waiting for, and we won't lie - it's totally worth the wait! 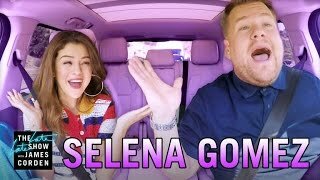 James Corden and Selena Gomez in a car? We didn't think that would give us so much joy, but it 100% did. The pair start off the segment as usual - singing songs in the car. No biggie. But then Selena being the absolute QUEEN that she is, drags the 'Late Late Show' host on to a rollercoaster for them to blast out some of her biggest hits, including 'Hands to Myself' and 'Kill Em With Kindness'... AS WELL AS A TAYLOR SWIFT ANTHEM! And just when we thought it couldn't get any better, the duo tackle shots of ginger (and James nearly passes out from it); they also rock up to through a McDonald's Drive-thru. Like, which A-list celebrities do that?! Also, calling ALL males - Selena is looking for a new man. You heard right. WARNING: This clip may contain high levels of squealing and awesome. But most probably, both.